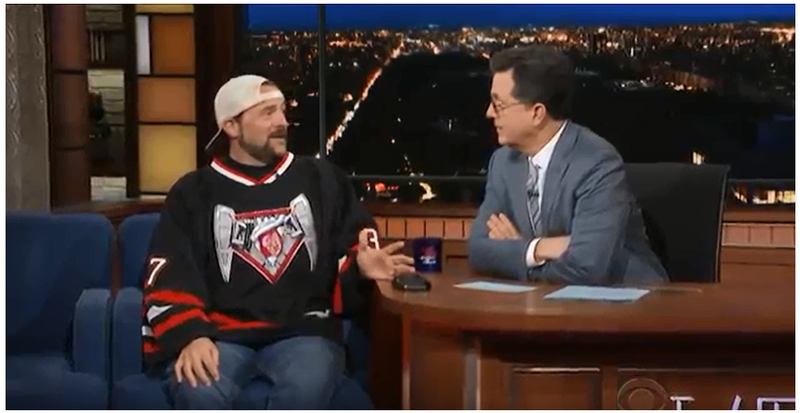 During his appearance on The Late Show with Stephen Colbert, Kevin Smith said that his doctor told him the weed he’d been smoking all day saved his life after he had a heart attack. The weed helped to keep Smith calm, preventing him from running up his blood pressure and therefore placing more stress on his already overworked heart. Smith told Colbert that he had been smoking bags of weed before he made it to the hospital and that he asked Dr. Ladenheim if the weed is what almost did him in. The comic book man said that Dr. Ladenheim told him his LAD (Left Anterior Descending Artery) artery, which is also called the widow artery, was 80% block. The LAD supplies blood to the heart. If the blood can’t get to the heart, then your heart can’t get oxygen. And y’all know that no oxygen equals y’all are out the door. Luckily for Smith, Dr. Ladenheim is “good at” what he does and he made sure Smith was upright when he walked out of the hospital. Go ahead and take a look at the video below to hear Smith talk about how weed and the good doctor saved his life.